A recent find was this 1930s Converse dollhouse, made of lithographed wood (the design is printed directly onto the wood, not onto applied paper). It's missing its two front porch pillars, but it's still a lovely little cottage, I thought. It measures 12 inches square by 10 1/2 inches tall, and opens from the right side. 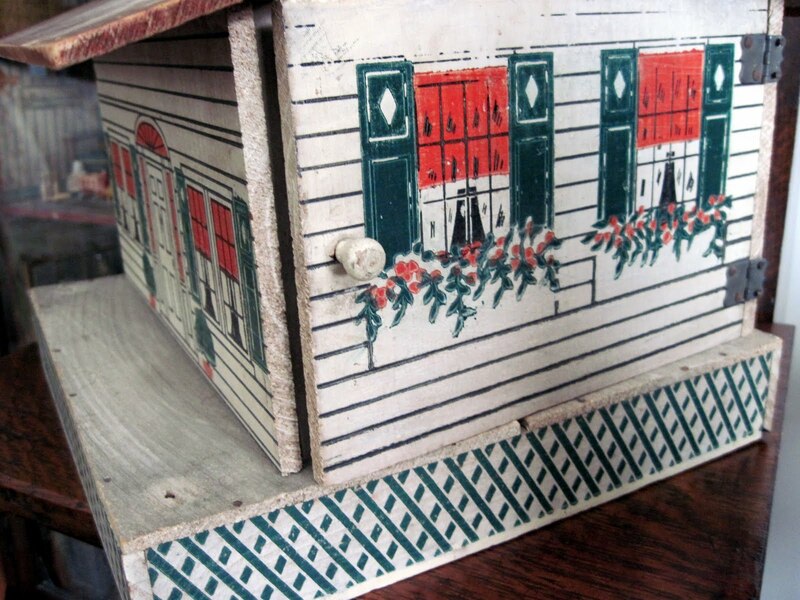 Access to the single room inside is via the end wall which opens with a knob instead of the more frequently seen latch. 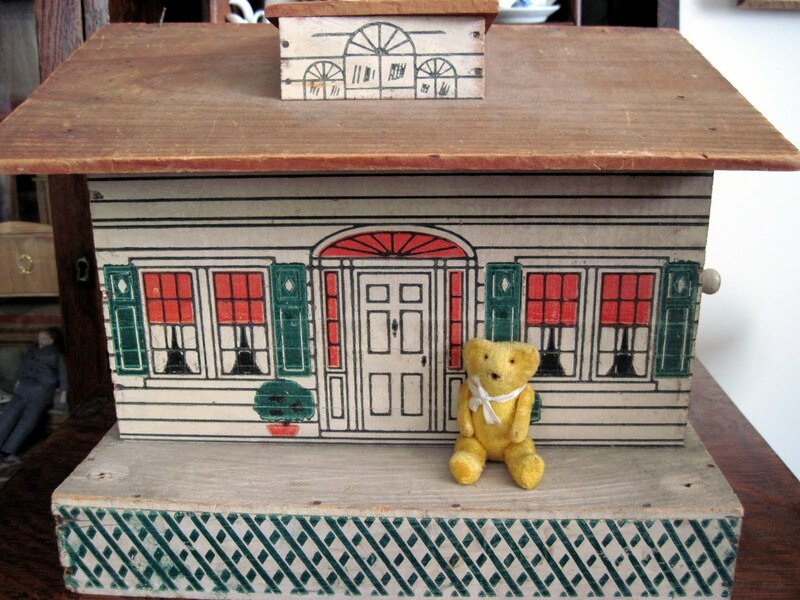 I've furnished it as a cottage for a little 3 inch dime store teddy bear of similar vintage, with pieces made by the Menasha Woodenware Corporation (fireplace excepted). 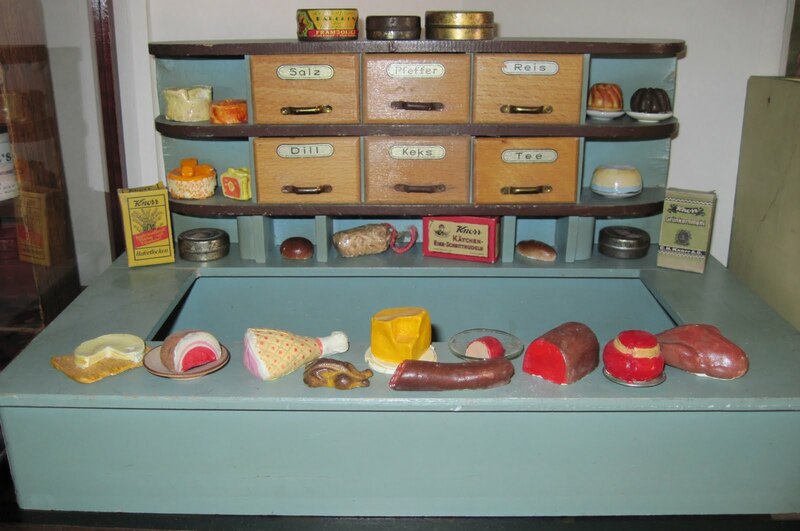 Menasha was founded in 1849 in Wisconsin, and was originally a maker of wooden barrels, tubs, and related items. 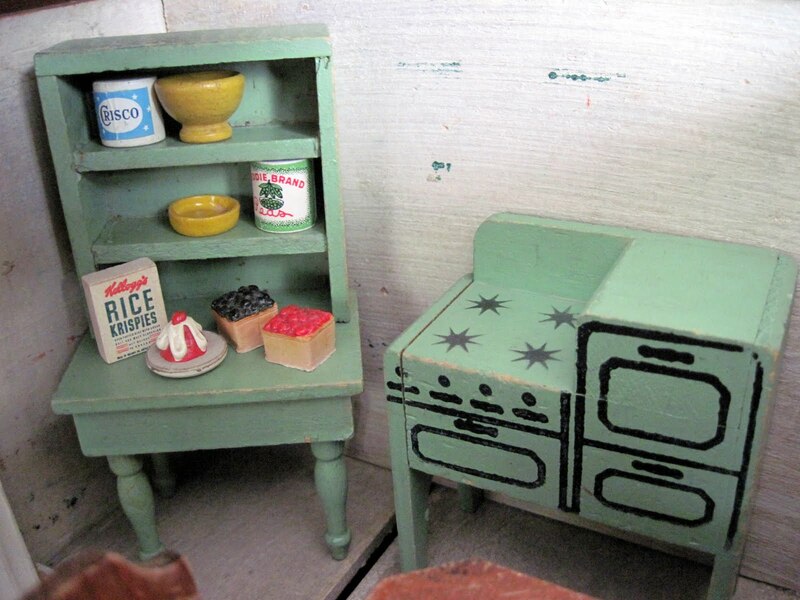 In the 1930s, they expanded their line to include wooden dollhouse furniture in the 1" to 1 foot scale. 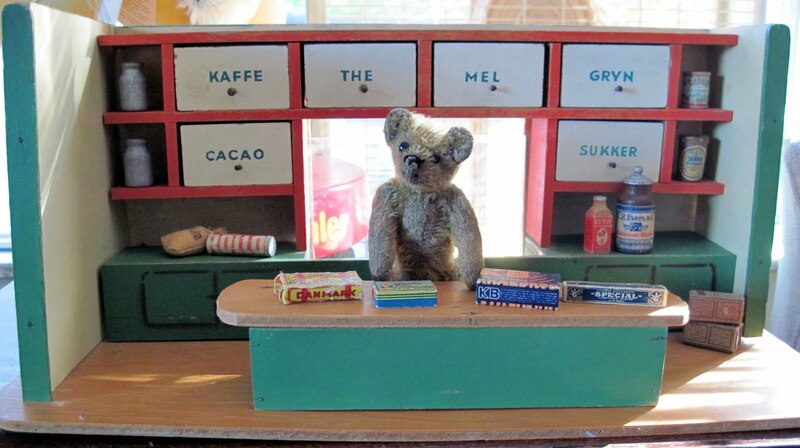 This toy furniture, trademarked "Tyke Toys," is hard to find now as it wasn't made for very long, but it kept the company in business through the Great Depression. 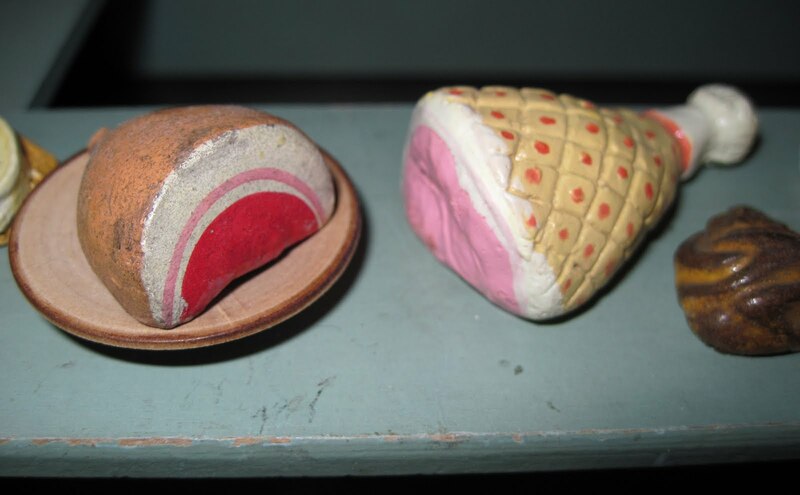 Menasha pieces are often misidentified as Strombecker, as the two firm's products are rather similar. A view of the inside from above, with the roof removed. Two of my favorite Menasha pieces are the kitchen cupboard and the stove. Last year I found this antique teddy like no bear I've ever seen. 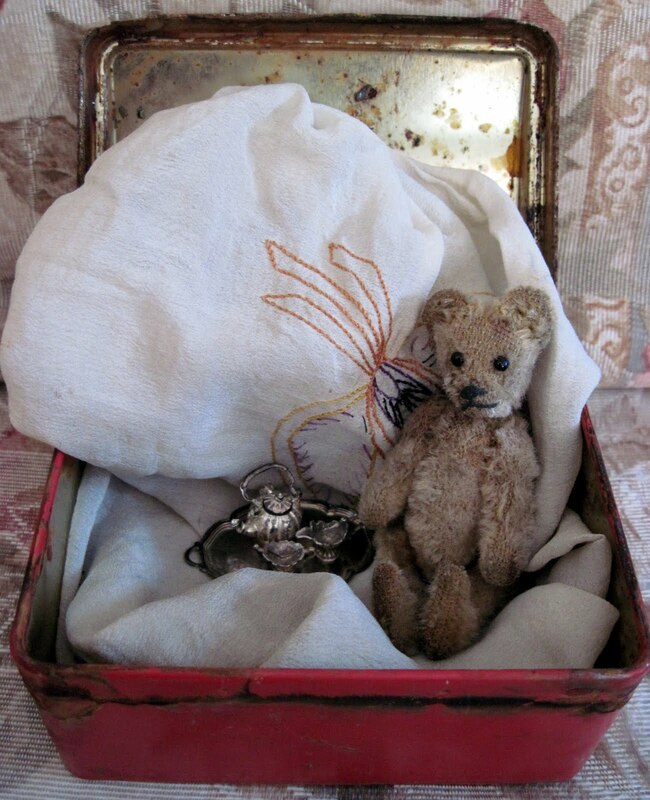 She's American and probably dates to the early 1920s, but other than that I'm stumped by her. 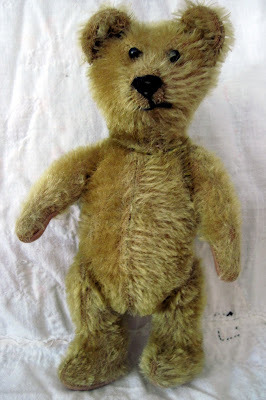 She has the most unusual body construction: her proportions are odd, with long, thick, perfectly straight arms and short, equally thick legs with very curved tops. Her torso is incredibly stout, and reminds me of a gorilla, or a wrestler. 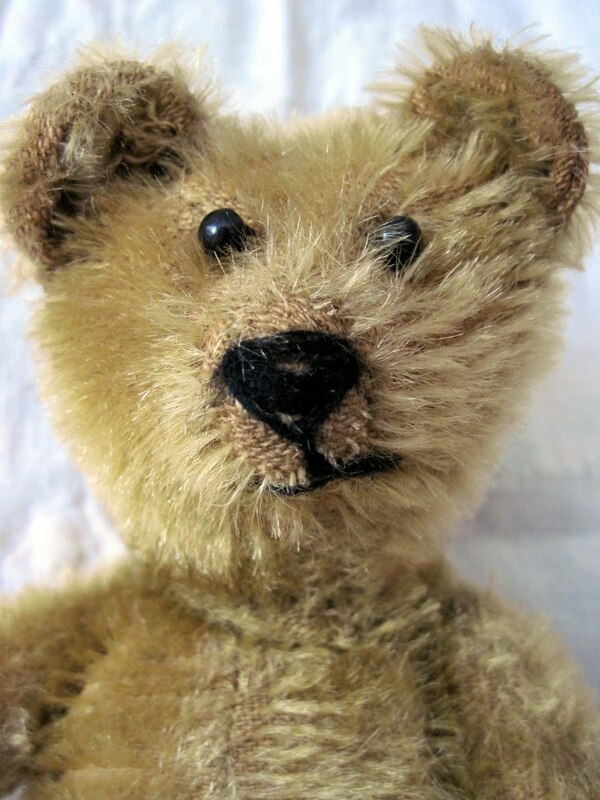 But her face is charming, with an inset cloth nose and a quirky smile, and I couldn't resist her. Antique toy collecting is, in many ways, a treasure hunt, and treasures can sometimes be hiding in the most unlikely of places...like this rusty five inch wide tin box. 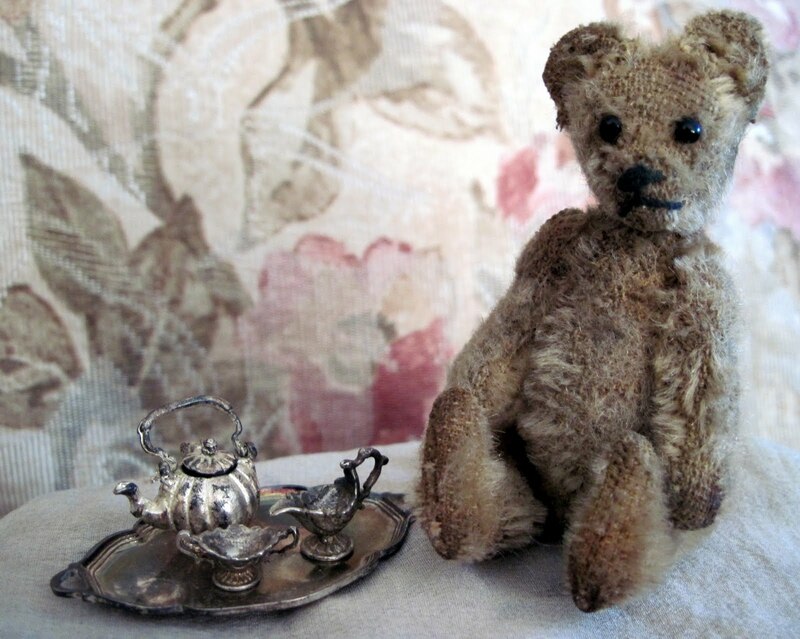 and the teapot is just an inch tall. 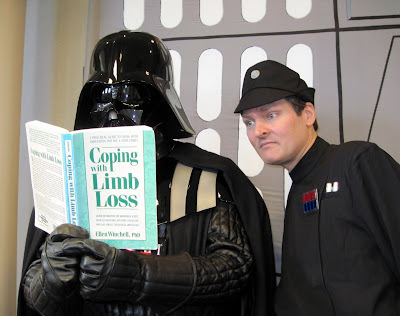 My favorite picture from the event is below. We found the perfect book for Darth Vader on our self-help shelves: Coping With Limb Loss: a Practical Guide to Living With Amputation for You and Your Family (this is, of course, only funny if you know that the character loses all of his limbs to lightsaber blows over the course of the films). 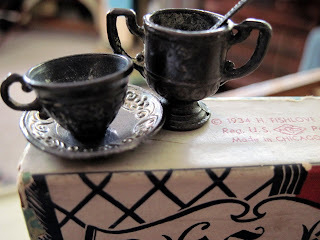 Some Other Stuff I collect besides old toys: vintage travel souvenirs. The kitschier they are, the better I like them. Today is the last day of school here in my town, and the kids are getting ready to start their summer vacation. 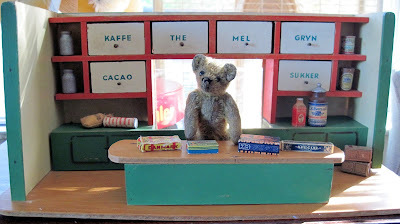 I thought this might be a good time to post some pics from a display I did at my library, featuring my favorite vintage travel souvenirs. Enjoy the trip! One of my favorite antique teddy bears, and one of the first I purchased years ago, is this comical little 8 1/2 inch British bear, made in the 1920s. 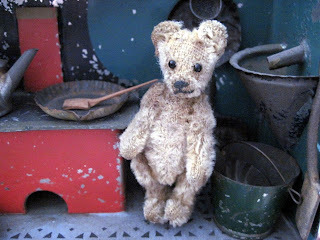 I can't identify a maker, but that doesn't really matter: he has such a great expression and so much charm. "Don't I just look irresistably kissable?" 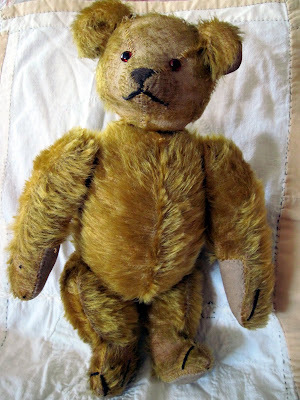 One of the rarest antique teddy bears in my collection is this one, made by the American company Aetna around 1907. 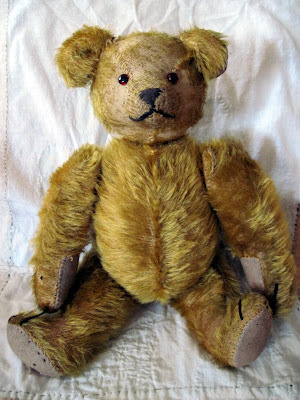 Aetna made beautiful bears with gentle, almost wistful, expressions, but for some reason the company was very short-lived, making their teddies hard to find today. 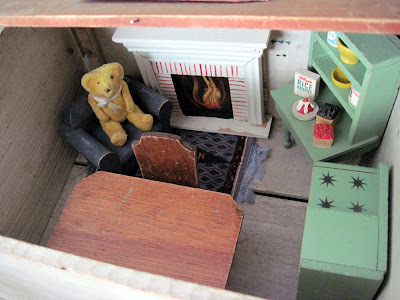 One of their defining characteristics was cardboard lining in the soles of the bears' feet. My example measures 11 inches tall and sports a new ribbon with a vintage American flag pin. 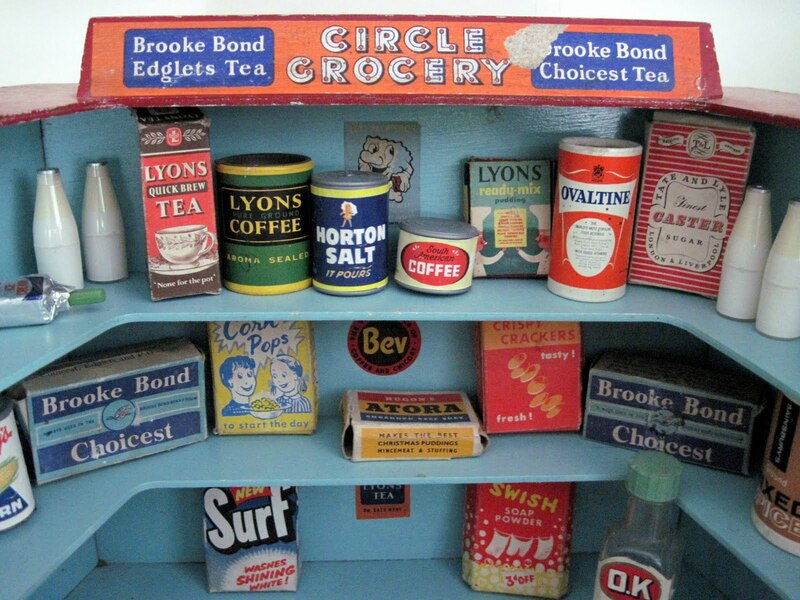 There was such a surprisingly positive reaction to my latest dollhouse grocery shop last week, I thought perhaps I should do a group post (I have six shops so far). 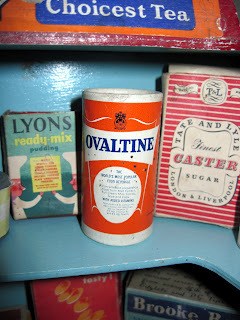 So here they all are! They date from 1914 to the 1950s, and include American, German, Danish, and British examples. My earliest shop was made by the American toy company, Cass, in 1914. It's constructed of cardboard, with a little wooden counter, and measures about 9 inches tall. The base the counter rests on folds up into the store for storage. 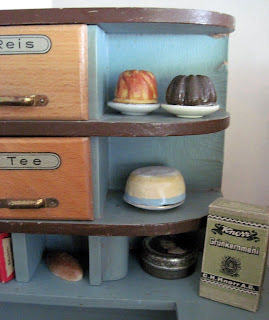 The cough drop box on the top shelf is original to the store, while the other pieces, while old, are not, but they seemed suitable. 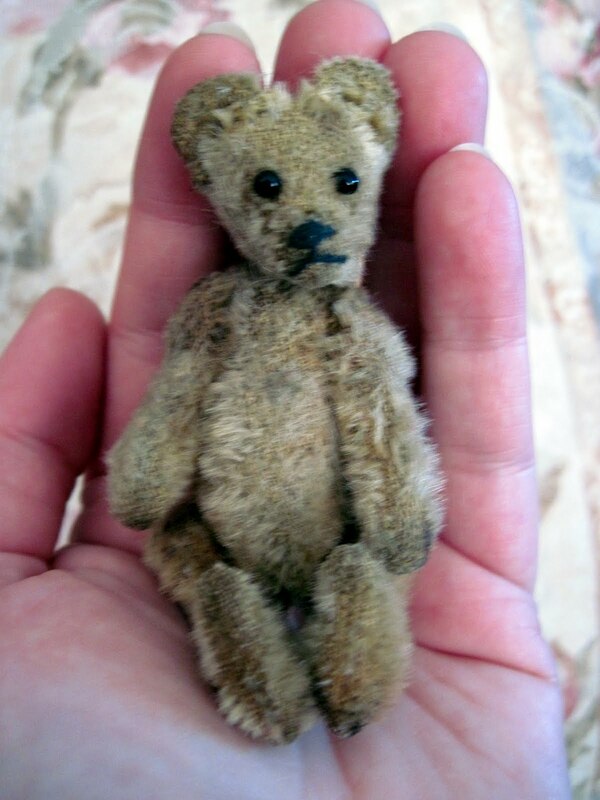 It's amazing to me that such a fragile little toy has survived for so long. 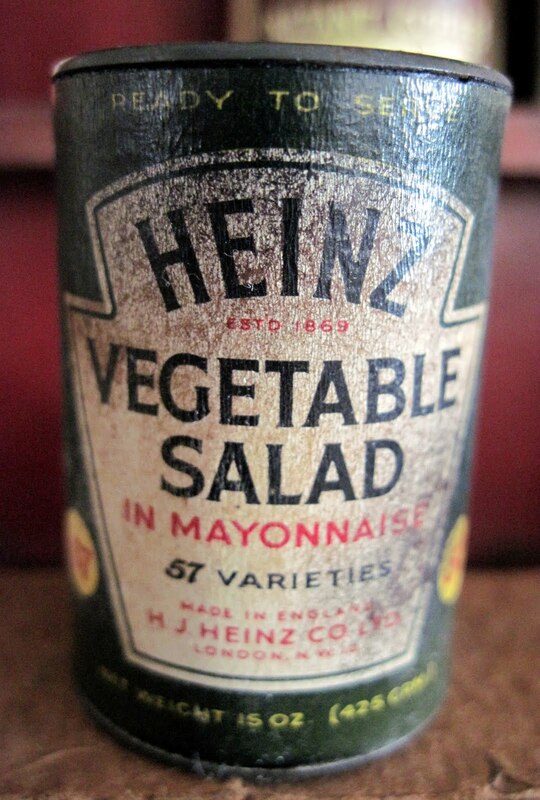 On the bottom shelf is one of my oddest old dollhouse food items, a 1 1/2 inch cardboard and tin can of "Heinz Vegetable Salad in Mayonnaise." 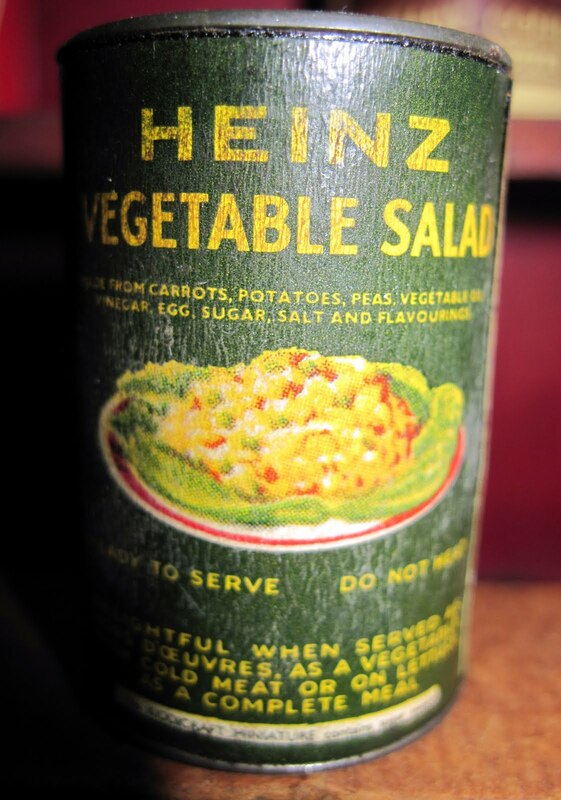 I nominate it for Most Disgusting-Sounding Canned Food Item ever conceived. Blecch. Next is my 1920s Danish grocery shop, staffed by a 5 inch Steiff bear. 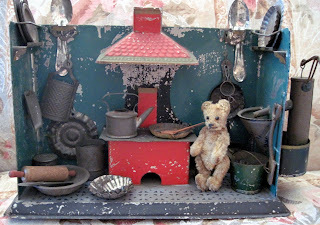 The shop is 16 inches wide by 7 1/2 inches tall. 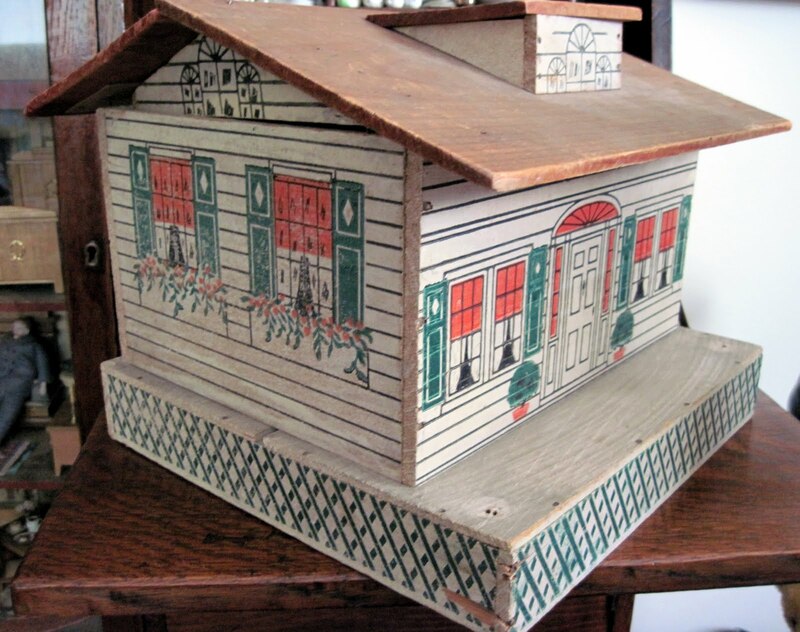 It's made of wood, with a separate counter, and retains many of its original items. 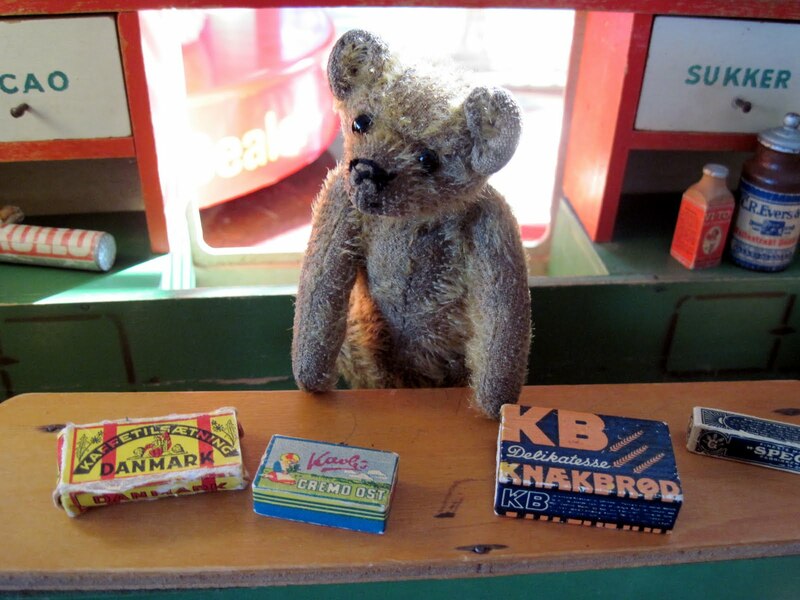 "Could I interest you in some Knakbrod?" 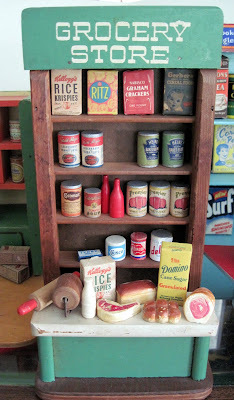 Here is the first antique dollhouse shop I acquired: a 1930s German Art Deco style grocery. 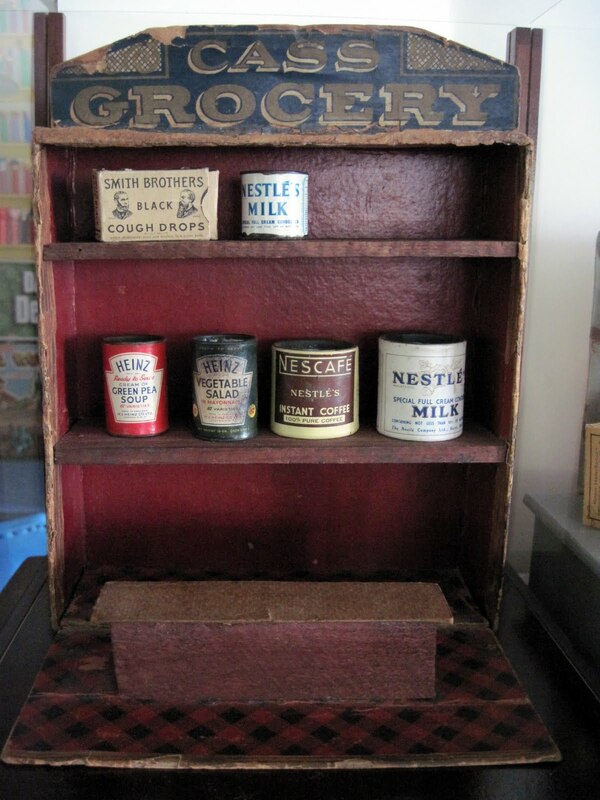 Made of wood and measuring 14 1/2 inches wide by 8 inches tall, it came with lots of old products, and I've added some more. 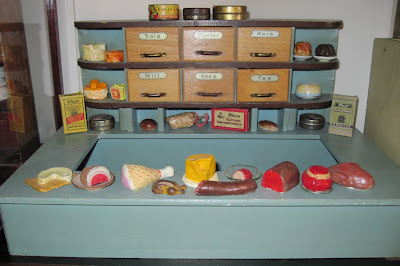 Some of my loveliest, and oldest, dollhouse food is in this shop, including plaster meats, sausages, and cakes from the late 1800s-1920s. 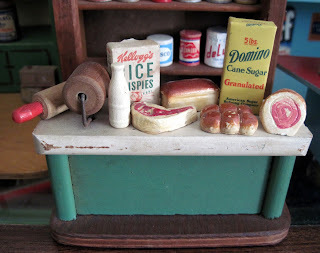 This next shop is a lithographed tin grocery made in America by Wolverine Toys in the 1930s. 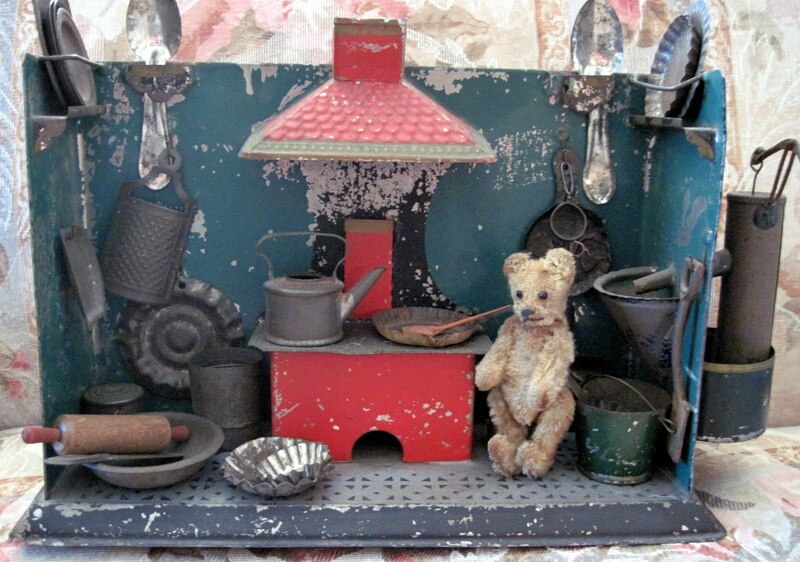 It's the largest of my shops, measuring 20 1/4 inches wide by 12 inches tall. 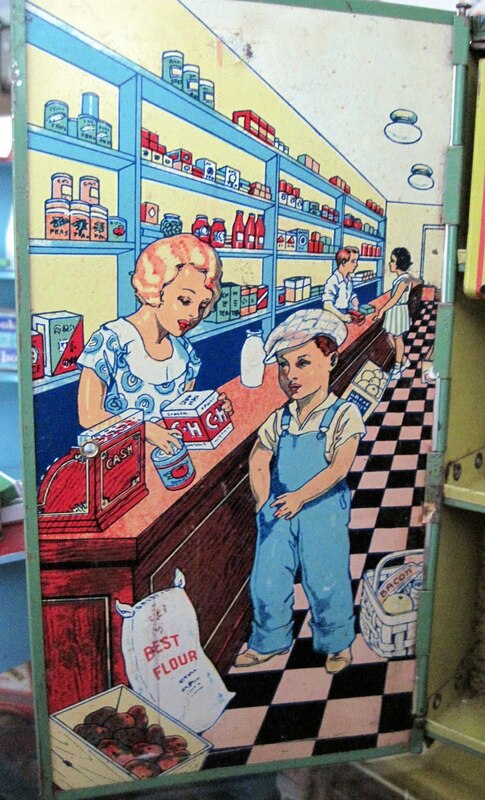 The two lithographed side panels fold in to close the shop up for storage. 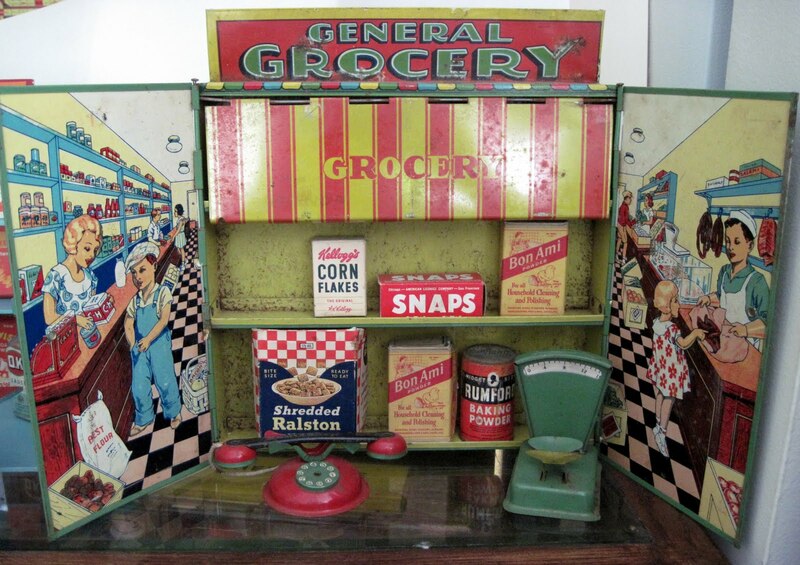 It's missing its separate counter, but the phone and scale, as well as most of the products, are original to this set. 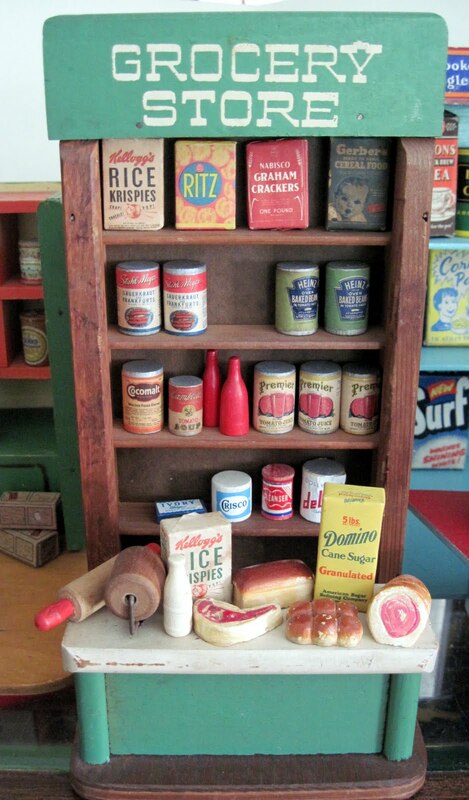 My smallest dollhouse grocery shop is this one, made in America in the 1940s, wooden, and measuring only 10 inches tall by 4 3/4 inches wide. I believe almost all the products are original to this piece, with the exception of a few Grandmother Stover's and Dolly Dear accessories. The counter features an attached "paper roll" (made of wood) on the left side. The week's shopping, ready to be bagged. My most recent, and one of my most unusual, shops, is this 1950s-early '60s British "Circle Grocery", also made of wood. 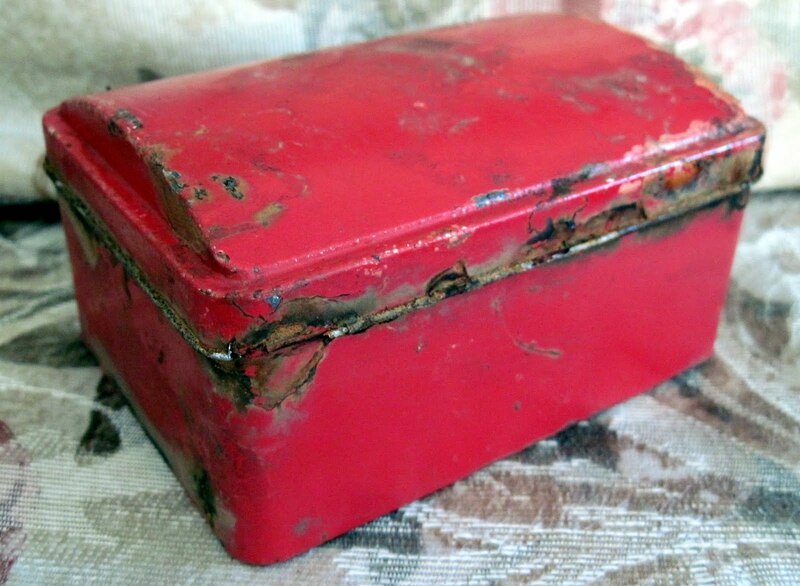 It's quite large, measuring 15 inches wide by 10 inches tall, and distinctively painted in red and turquoise. 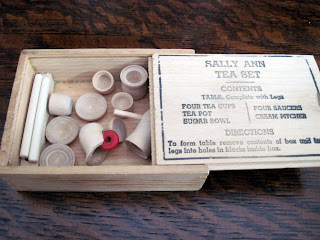 Being British, it naturally came with lots of packages of tea, as well as many other interesting pieces. 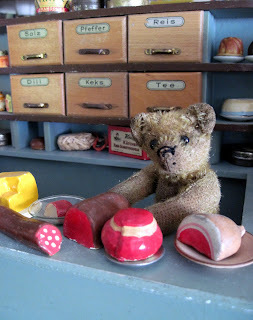 The groceries upon the counter are a much smaller scale than those on the shelves, but it all came together and seems to work out. 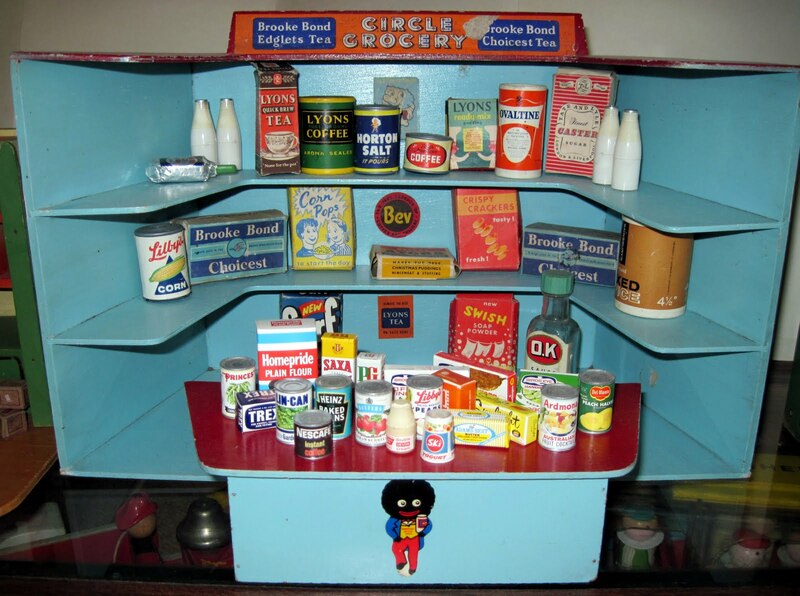 The golliwog sticker on the counter was a premium from Robertson's, which I believe was a preserves manufacturer. Another addition to my toy tea set collection, this boxed version dates to 1934, and was made by the H. Fishlove Company of Chicago, who were more frequently producers of novelty joke boxes and gags. 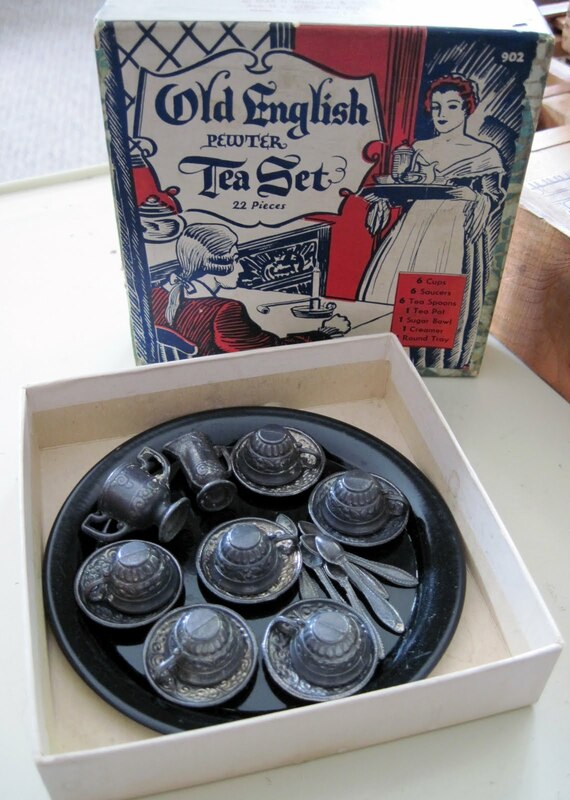 The set is pewter (except for the tin tray), and the pieces are rather heavy. The teacups measure 1/2 an inch tall, and the box is 4 1/4 inches wide. 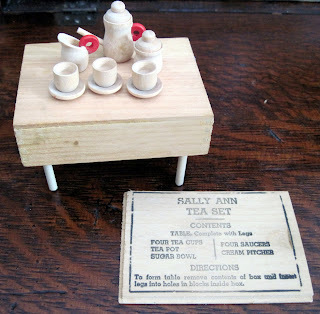 Although I don't much like tea in real life, for some reason I love toy tea sets, and am always on the lookout for another one to add to my collection. The dollies and teddy bears just can't get enough tea sets. 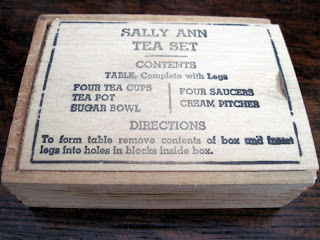 My most recent find was this, a very unusual boxed wooden set, circa the 1950s or early '60s. 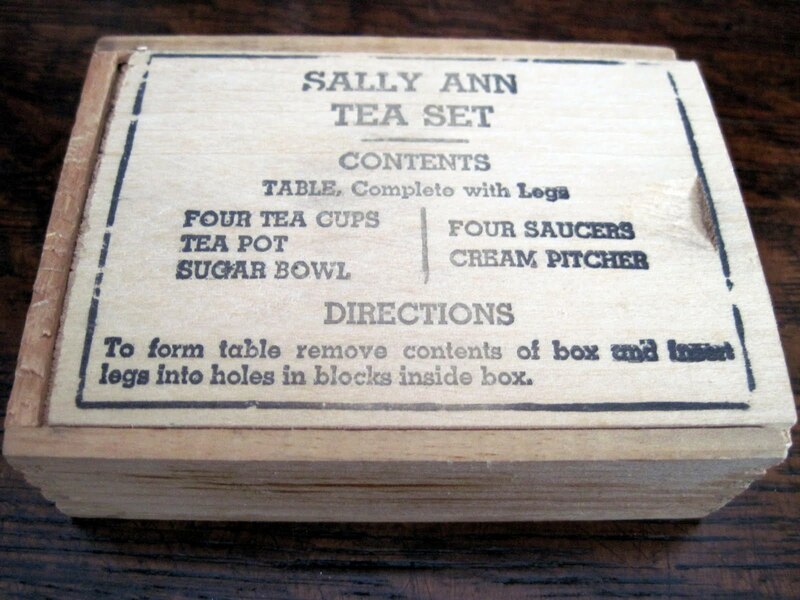 The small box measures just 4 inches wide, and contains a complete set of tiny tea things, along with four legs that, when inserted into the box lid, create a tea table. 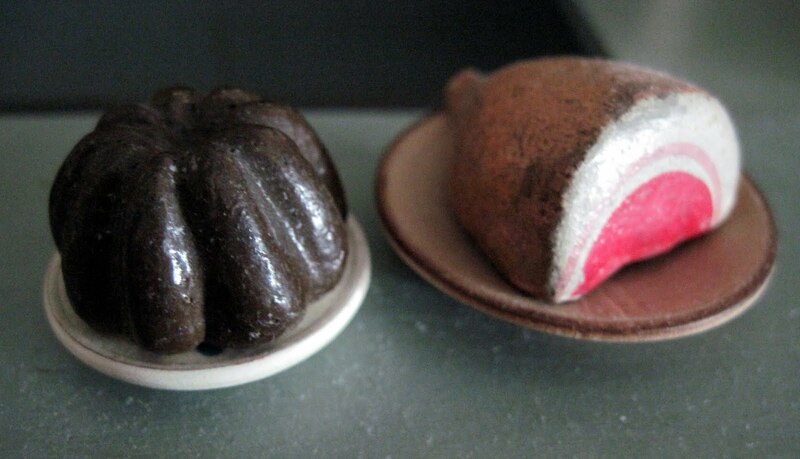 It's pretty amazing. 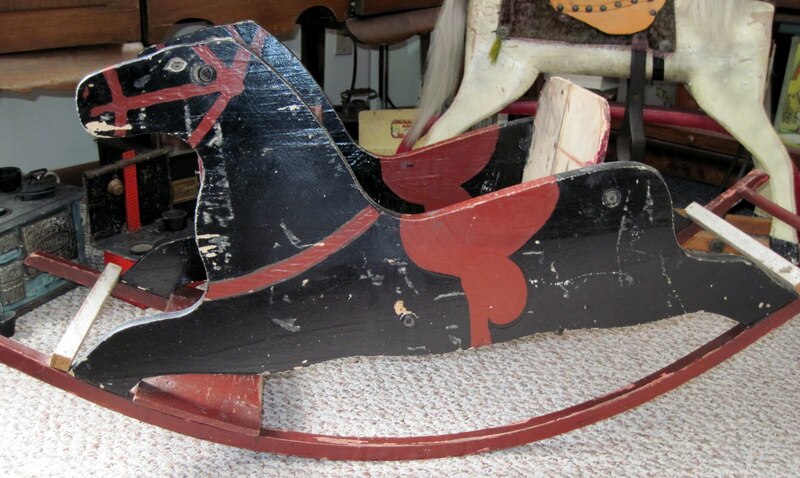 On my birthday antiquing trip this past weekend, I found two old rocking horses, this 40 inch long shoofly rocker circa 1900, and the 1930s homemade spring horse shown in the previous post. 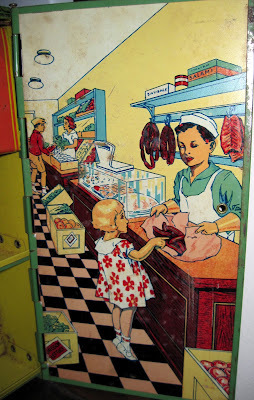 Like most old shooflys, he's been painted over, although it looks like this was done long ago. I'll probably strip and refinish him, since the repaint covers all his impressed details, including his mane and tack. Still, I thought he was a nice horse, and he was a steal at $20. 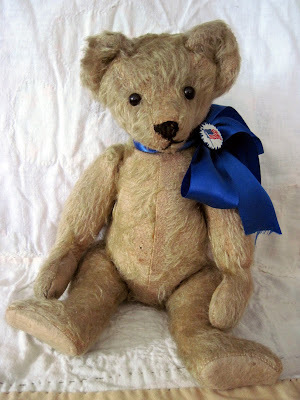 The teddy bears are going to enjoy riding in him.